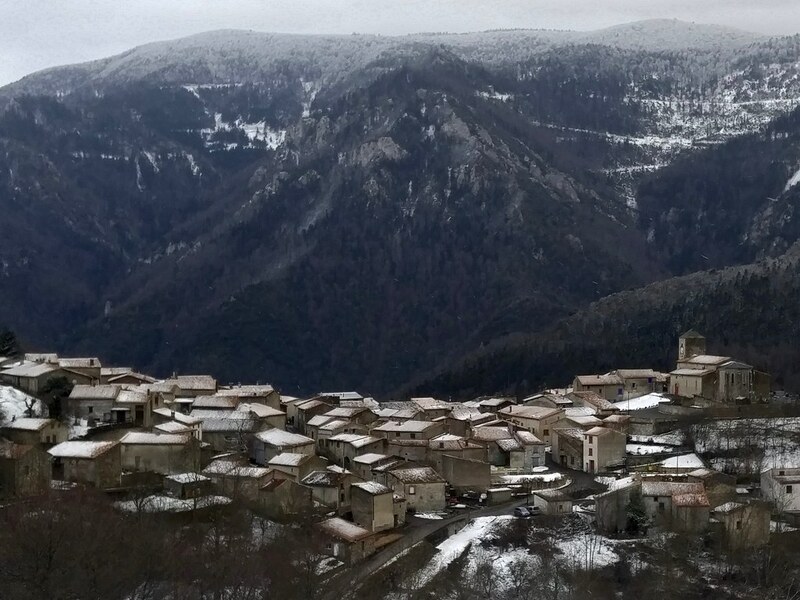 We spent the first week of winter break with friends in Bessède-de-Sault, a little village of 50 people on a small plateau in the foothills of the Pyrénées. There's not much going on in the village other than a couple dairy cow operations, sheep herding, and vacation homes. There's not even a tabac or boulangerie. 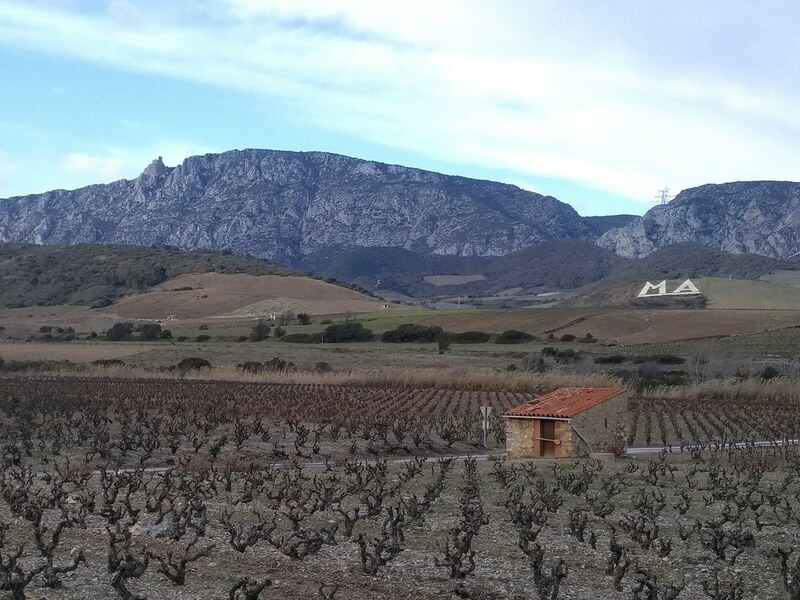 The closest stores are in Axat, 15 km down the Aude River gorge, or Mijanès, 15 km up at the head of the valley. Our friends restored a old house 40 years ago and have been spending summers and winter vacations here ever since. 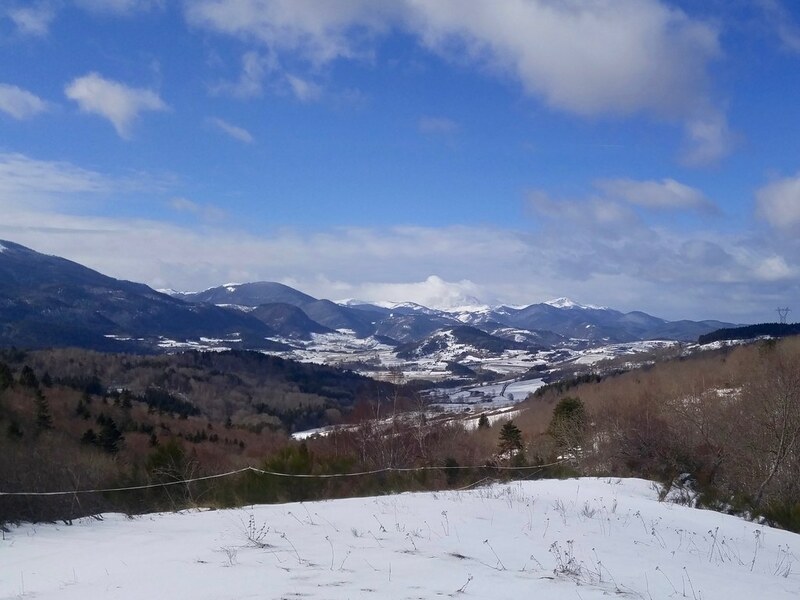 I went for several long runs in the snow. The forest here at 900-1500 meters elevation is a mix of evergreen and deciduous trees. Empty chestnut husks still cling to the trees, giving the mountainsides a distinct ruddy color. Spring is yet a few months away in the Pays de Sault. 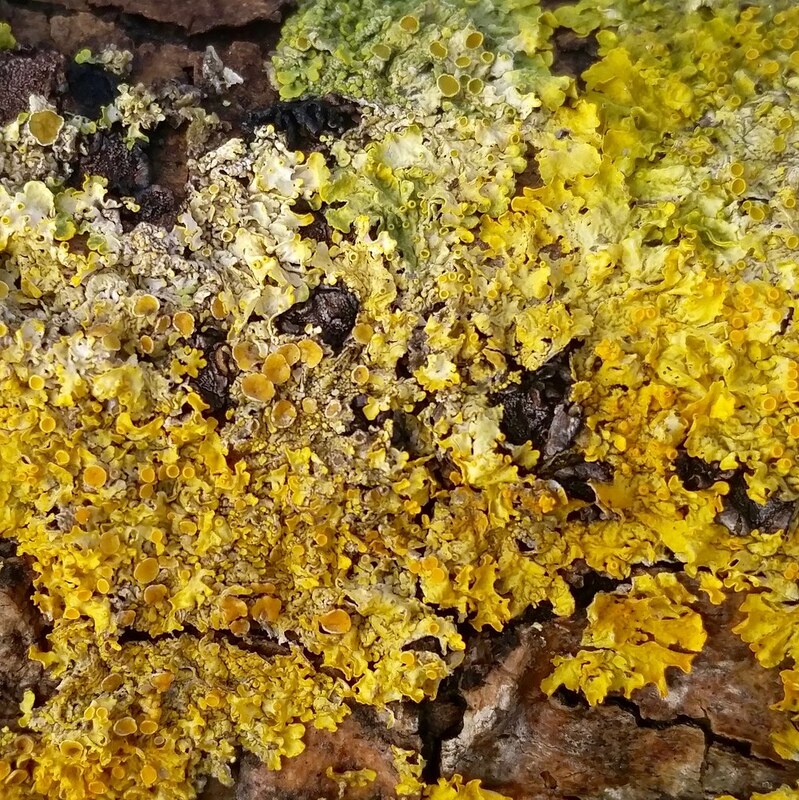 The brightest colors I saw in the woods were these abundant yellow-green lichen. This was largely a ski trip and we skied 3 days at Mijanès-Donezan, a tiny ski station on the east side of the Col de Pailhères. It was like going back in time: Donezan has only surface lifts and a 3-day adult pass costs only €50. A glass of beer is only €2.50. The mountain and its trails is about the same size as the front of Eldora (Challenge Mountain). 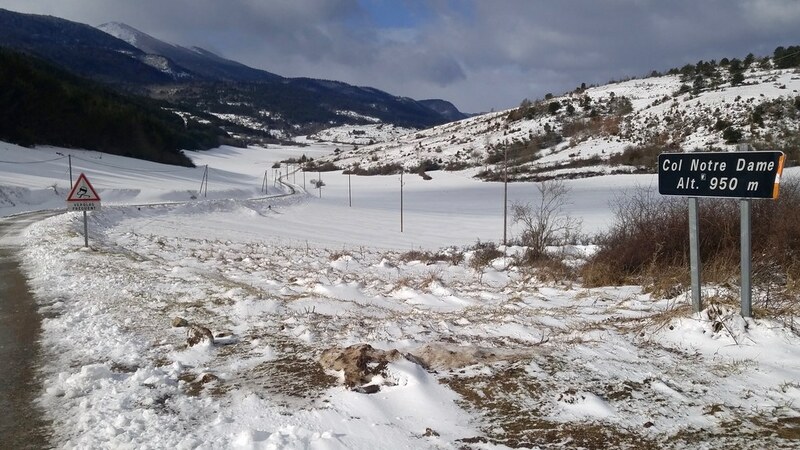 One short surface lift, what French skiers call a tire-fesse, and then a longer one take skiers from the base at 1500 meters to 2000 meters on a shoulder of Pic de Canrusc (2133 m). 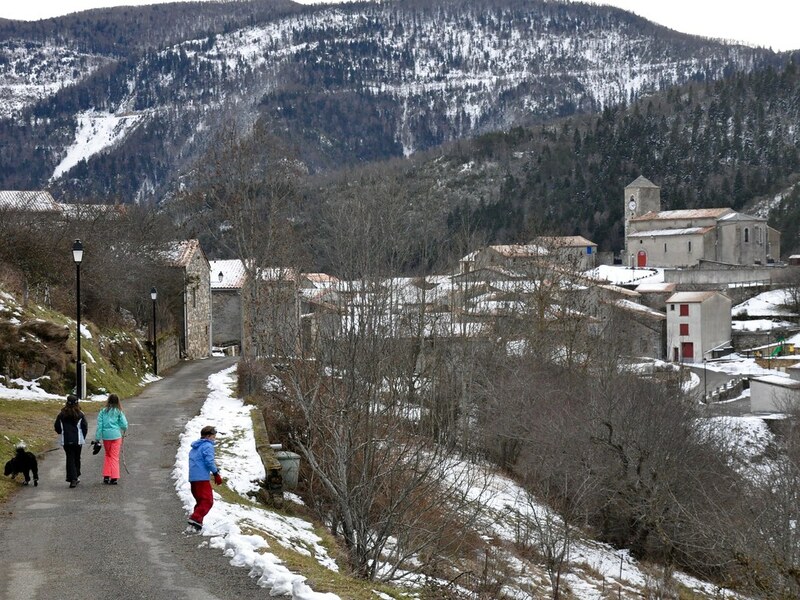 Our first attempt to ski was denied due to rain, not unusual in the Pyrénées. Conditions soon improved: 8" of fresh snow fell on Wednesday, followed by 3 straight days of sunny and mild weather. On every trip to the station, we passed beneath the ruined Château d'Usson. The region is dotted with 11th and 12th century fortresses, remnants of the region's struggles against the Pope and France. This part of France might be Catalan or Spanish today if not for the defeat of the Count of Toulouse and the King of Aragon in 1213 during the Albigensian Crusade. The red and gold of the royal arms of Aragon can still be seen today in emblems of southwestern France. The Albigensian Crusade was a five decade program of Catharist Christian extermination carried out by the Roman Catholic Church and its military allies, eventually including the King of France. Hundreds of thousands of people were condemned as heretics and murdered in this corner of France. 20,000 were massacred on 22 July 1209 during the Sack of Béziers. Bessède-de-Sault is two hours south of Carcassone, two and a half hours southwest of Béziers. Both the D117 and D118 routes pass by and through spectactular limestone badlands. 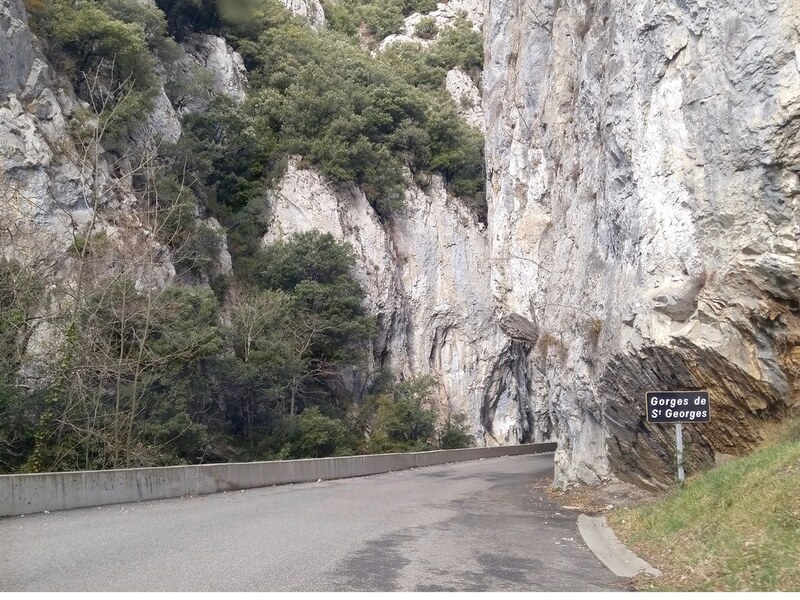 I took photos of the Gorges de St Georges, but its essence mostly evaded my G4's camera. The Gorges de Galamus is another that's popular with canyoneers and vacationers looking for a place to cool off in the summer. The Gorges de Joucou is the closest to Bessède-de-Sault and one I'm eager to see. That web page about it is a work of love. Many things about this part of France remind me of my favorite places in the Intermountain West of the United States: the wildness, the rock formations, the mixed grazing-forestry-tourism economy. Towns like Axat and Quillan have plenty in common with Salida, Colorado or Dubois, Wyoming. I'm coming back to the region at the end of March to run in a race at Quillan. The course goes up and over and around bluffs like these ones outside Maury. I'm hoping to do a little bit of wine tasting and shopping at Mas Amiel and other Maury vineyards on the way.